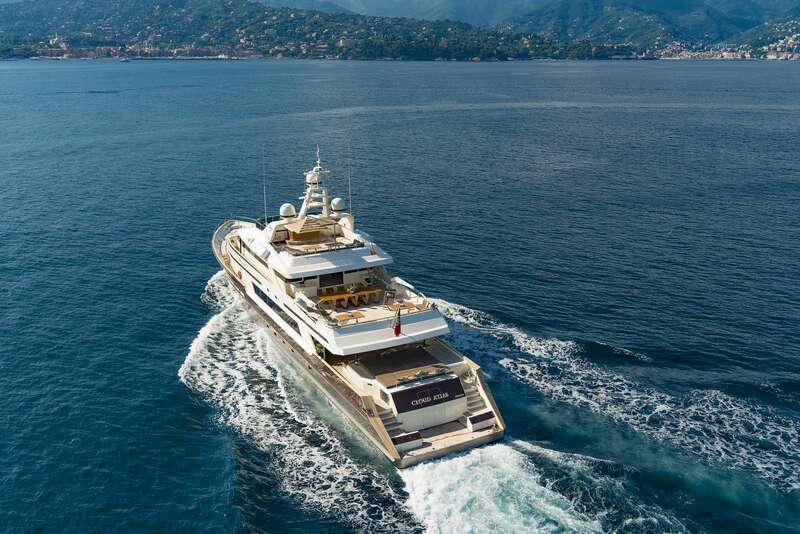 Launched From Lloyd Ships yard in 1990, the stunning 46 m. super yacht Cloud Atlas completed a refit in 2016 whereby she was fully reconditioned, including, among others, a 4 m. hull lengthening with new garage for water toys and total rebuilt of the main engines and generators. 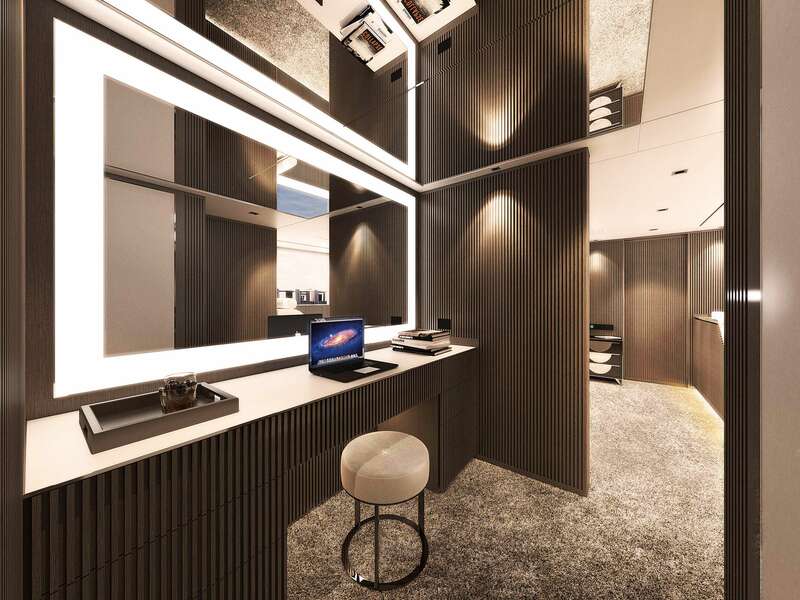 In 2018/19 she will undergo a new redesign of the main salon, the lower deck and the wheel house, that will turn the décor into a minimalist-classy style and that will slightly change the layout of the cabins (details below). 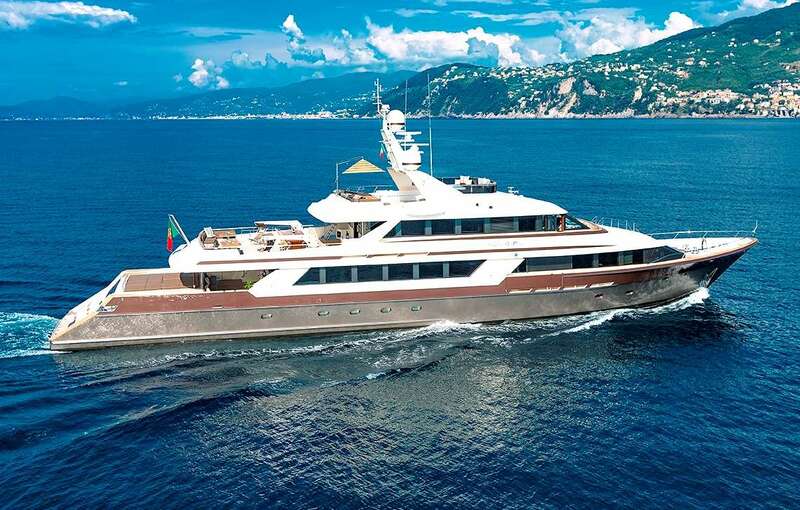 Her beautiful sleek lines and the skillful use of glass creates a perfect harmony between the exterior and interior making her an ideal yacht for summertime cruising. Her elegant, timeless shape is an imposing sight on the waves whilst her vast living areas offer unlimited comfort to every charter guest. On the main deck, the large salon with a comfortable lounge, a separate formal dining area and a well equipped bar, form a fabulous entertaining area that combines a sense of warmth and comfort in a sophisticated style. The skylounge on the upper deck holds a beautiful TV area with plenty of seating and panoramic windows. 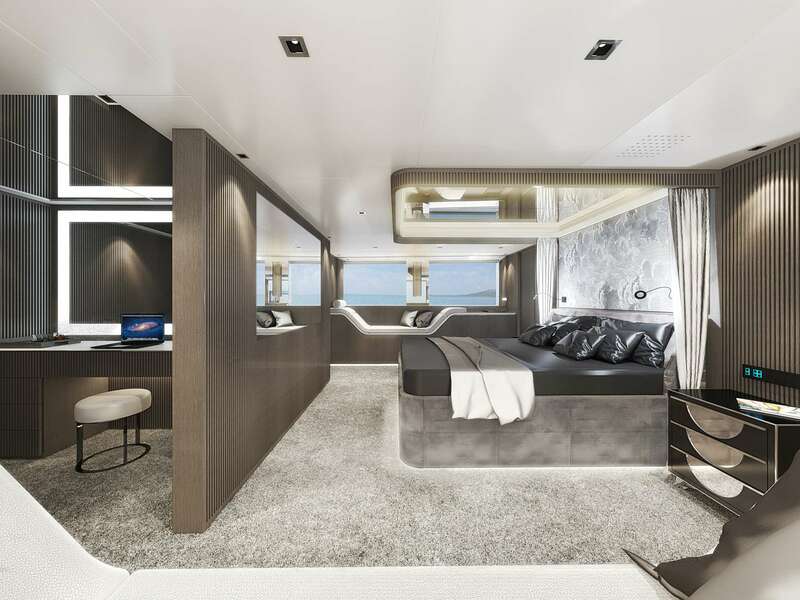 Sumptuous accommodation is arranged across five cabins: a breathtaking master suite on the main deck with desk, vanity and double bathroom with Jacuzzi; two double suites on the lower deck, one of which is convertible into twin and the other has a sofa bed; two twins (one with additional Pullman berth). 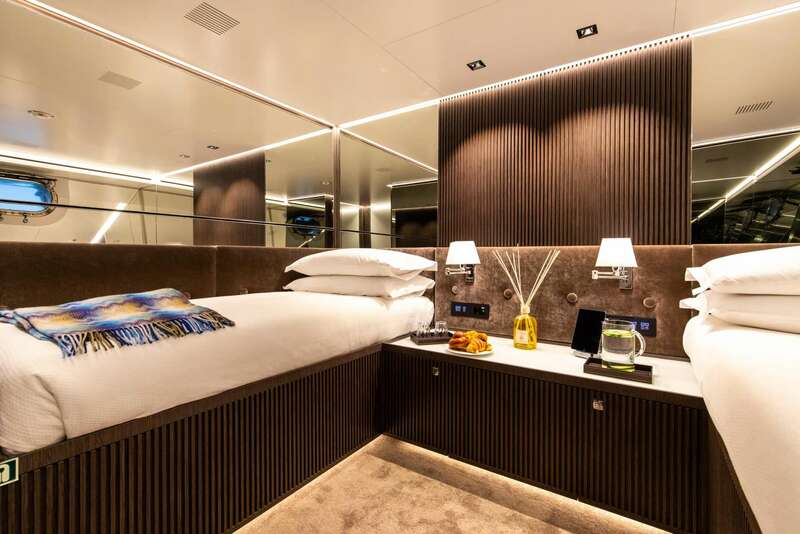 The sofa bed and the Pullman berth are suitable for small children or nannies, and all cabins have beautifully appointed marble bathrooms and the latest entertainment systems. The skylounge also holds a convertible sofa that easily transforms into double bed. 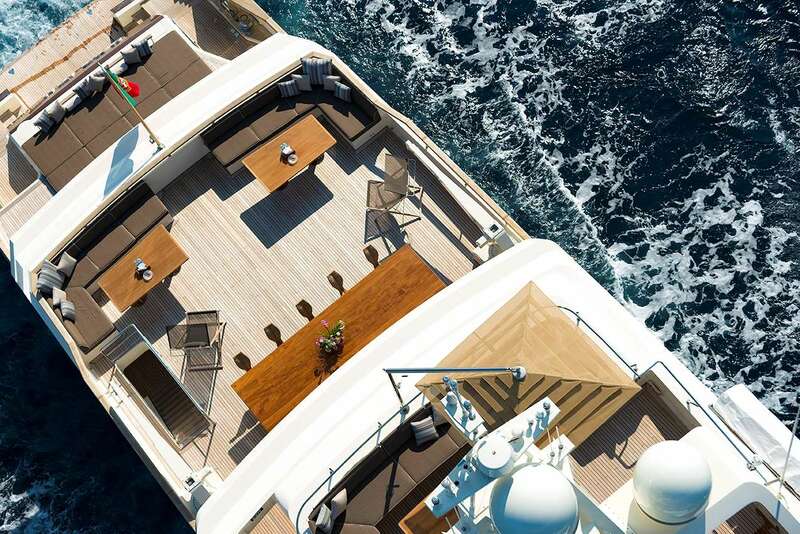 Covering three decks, her expansive outdoor space play host to endless facilities to ensure to make sure that every guest is kept comfortably entertained throughout their cruising holiday. 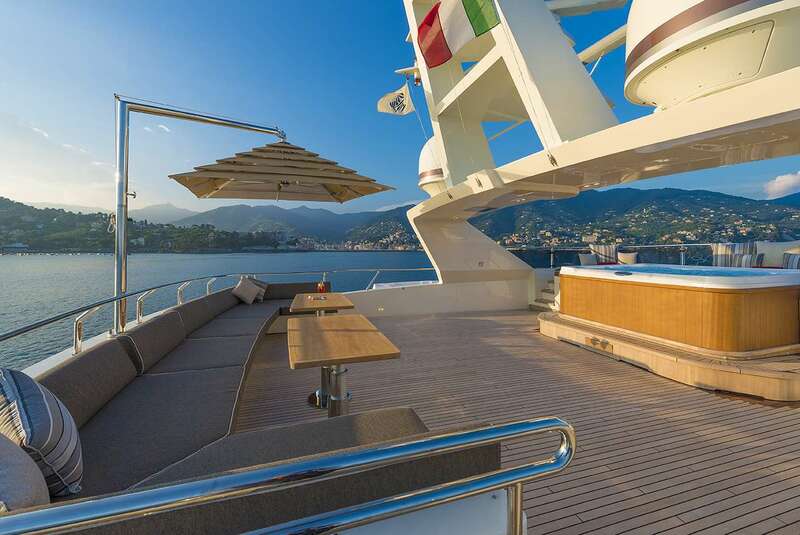 The spacious sundeck houses a large Jacuzzi with an ample solarium and shaded seating while the upper deck holds an alfresco dining area, sun-loungers and an outdoor bar. A number of other sunbathing and lounging areas are situated throughout. Her garage is bursting with toys and her spacious swimming platform also doubling as a beach club. 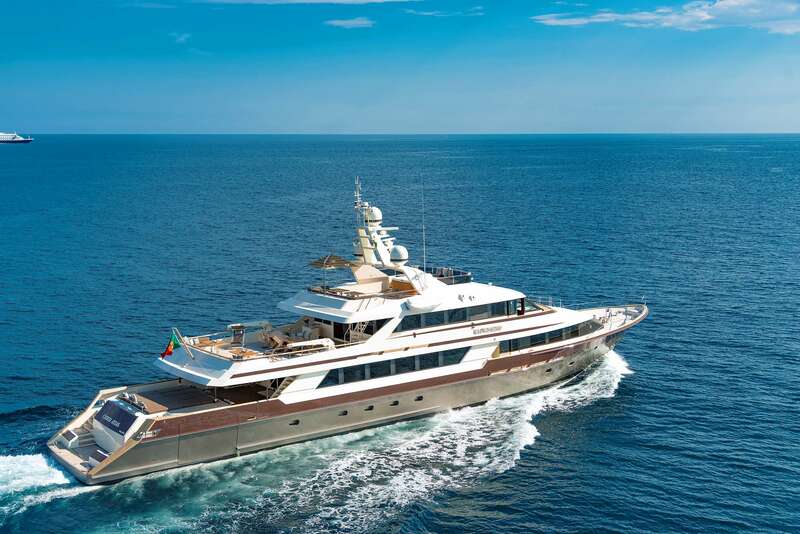 Cloud Atlas has an highly experienced crew of 9, ensuring that every guests’ needs are exceeded while on board this prestigious yacht. Please note that current photos show the yacht before the 2018/19 refit and redesign. Updated photos coming soon.